IDW has announced that the Sonic comic will be getting its very first oversized issue next March with Sonic the Hedgehog Annual 2019. This 48-page comic is not only a first for the IDW series, but also the first oversized comic Sonic has starred in in over 18 years. A big comic requires a lot of people to make and the list of creators for this comic is sizable. This issue will be featuring work from series veterans Ian Flynn, Evan Stanley, Jennifer Hernandez, Jonathan Gray, Caleb Goellner, Diana Skelly, and Gigi Dutreix. The comic will also be introducing new creators from other IDW comics, including Jack Lawerence (Transformers: Lost Light), Cavan Scott (Star Wars Adventures), and James Kochalka (Johnny Boo). In addition to all of these new creators, the comic will also feature a cover variant from veteran Sonic game artist Yuji Uekawa. Uekawa is best known for his work in the Sonic Adventure games, which introduced Sonic’s modern, green-eyed look. This cover will mark Uekawa’s debut in Sonic comics. The other two variant covers will feature art from Hernandez and Nathalie Fourdraine. The issue will cost $7.99, and the number of individual stories it will feature are currently unknown. Stay tuned for further details! A Tangle and Whisper story from Ian Flynn and Jennifer Hernandez. A Sonic and Tails story from Caleb Goellner and Jack Lawerence. A Rouge the Bat story from Cavan Scott and Diana Skelly. A Sonic fan club story from James Kochalka and Jon Gray. A Blaze and Silver story from Evan Stanley and Gigi Dutriex. 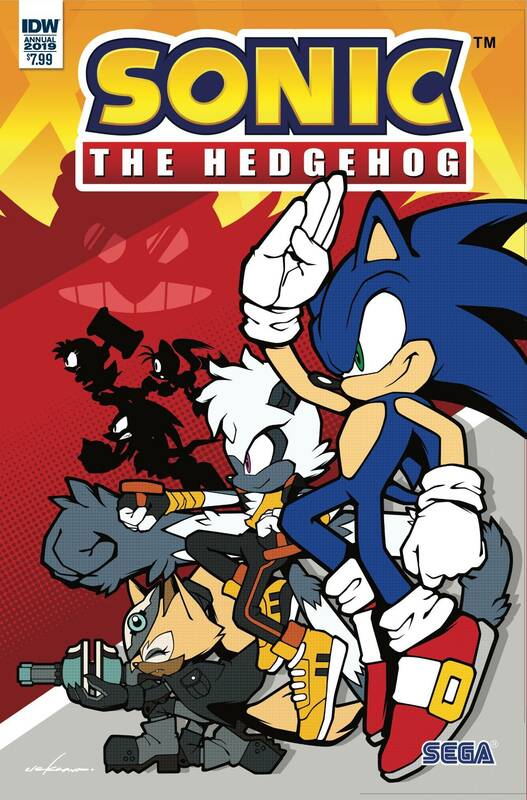 The angular style of the characters on Uekawa’s cover gives me Sonic Battle vibes. A Silver and Blaze story by Evan Stanley!? SHUT UP AND TAKE MY MONEY!! !